Years ago, my brother told me he didn’t like soups that had fruit in them because he thought they confused the taste buds. At the time I smiled, nodded and cringed as I thought about the pepper and pear soup I had just made him as a Christmas present. Yet I understood what he meant. He wanted familiar foods to stay in their familiar places. There are rules, after all! Sweet goes sweet, savory with savory. That’s why dinner and dessert are separate courses. Great chefs, however, like to tweak the rules. If they think a mix of persimmon and sweet potato will taste good, they won’t hesitate to blend the two, regardless of what my brother says. These people are in the business of making tastes not following conventions. They also offer great ideas to people like me. I’ve made my share of savory soups that had fruit in them but until this week, I’d never made a dessert that had something savory* in it. At the last multicourse meal we put on (back in April, see my Asparagus soup recipe, take two, (it’s buried in the Caesar Salad Soup recipe), my friend the executive chef (you can call me sous.) found a terrific strawberry shortcake that featured basil and (twenty-five year old) balsamic vinegar. It was incredible. As I thought about this week’s ice cream, I took inspiration from my friend who himself took inspiration from someone even better. Why not try a basil ice cream with strawberries? It turned out to be a pretty darned good idea, for the most part. It started the same way all my other ice creams started, with Grandma’s Vanilla ice cream recipe from Good Housekeeping, minus the vanilla. Instead I made a basil infused simple syrup and used several tablespoons of that to flavor the ice cream base. So far so good. The problem started when I decided to blend in the fresh chopped strawberries. Despite my wise pronouncement last week that you shouldn’t add fresh fruit to an ice cream freezer because you wind up with tiny fruit-flavored ice cubes. I had sidestepped this problem with my peach ice cream (see here) by pureeing the peaches into the custard prior to freezing. I didn’t sidestep anything this week. What I wound up with was a number of strawberry flavored ice chunks dispersed in a really delicious ice cream. And I mean really delicious. My youngest, the one with a dangerous gift for flattery, called it the best ice cream yet. Of course, I could have melted the ice cream, strained out the frozen strawberries and refrozen the custard, but who has the energy for that. It’s summer. Lucky for you, I’ve given you ample warning not to put the strawberries into the ice cream freezer. Serve them on the side instead. Strawberries are great right now and the basil is as high as small ceramic elephant’s eye. May as well feature them both. It is a chef-approved combination, after all. I’m not so sure my brother could get behind it, but then I’ve always been the rule-breaker in the family. *NOTE: In the culinary world, savory and sweet are opposites. Typically, entrees tend to be savory, while desserts are sweet. Ironically, this makes all desserts unsavory and all unsavory characters down right sweet. Go figure. Beat eggs and add ½ cup of mixture while beating, then add eggs to mixture.HEALTH NOTE: Since you’re dealing with eggs here, you need to take care when cooking the custard. Too much cooking and the custard gets lumpy, too little and you risk salmonella. Another alternative is to use pasteurized eggs. Heat the mixture for one minute over medium, then cool with plastic wrap or wax paper pressed onto the top of the mixture to keep it from developing a skin. Cool for several hours or overnight. In the meantime, make basil syrup by heating the water in a small sauce pan and stirring in the sugar until it dissolves. When sugar has dissolved completely, remove the pan from the heat, add the basil and cover for 15-20 minutes before straining and cooling completely. Add the cream and 6 tablespoons of the cooled basil syrup to the cooled custard mix, and freeze. Upon freezing, serve the basil ice cream with a generous helping of fresh strawberries. 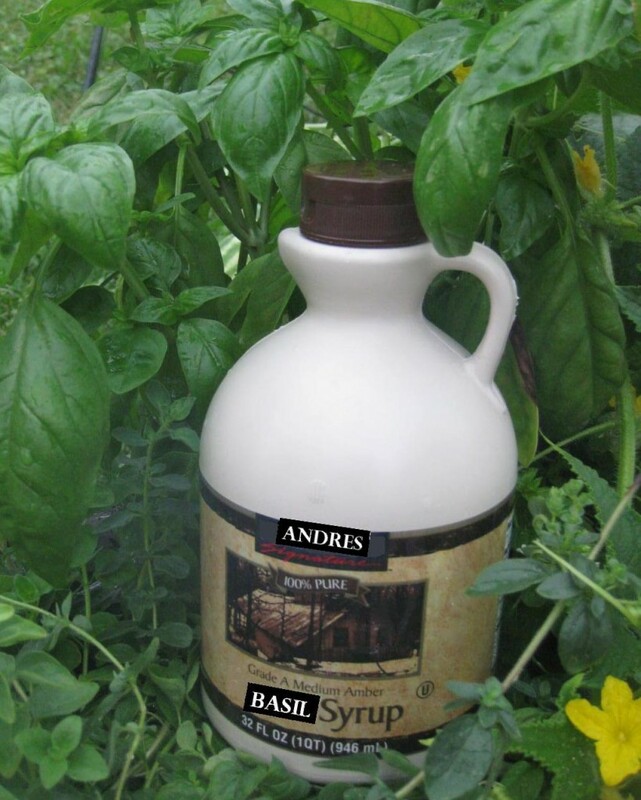 Photo Credit: “Home Grown Basil Syrup,” from the MS Paint and a camera. What’s your choice for best savory dessert or unsavory for that matter? What’s your selection for best sweet entrée? Leave your nominee in a comment.